Dr Ashok Bhan receiving Paul H. Appleby Award. NEW DELHI, Oct 21: Kiran Bedi, Lt. Governor of Pudicherry and Dr Ashok Bhan, former Director General of Police, are amongst this year’s Paul H. Appleby Awardees for distinguished service to IIPA and to the subject of Public Administration in the country. The award was given by Shri T. N. Chaturvedi, former Governor and Chairman of the IIPA in a function held here. 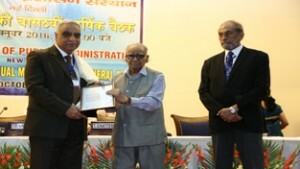 The award has been instituted by the Indian Institute of Public Administration in the name of Dean Paul H. Appleby, on whose recommendation the Institute was established in 1954. Previous recipients of the award include N. N. Vohra, Governor of Jammu and Kashmir, Dr Karan Singh and Veeranna Aivalli, former DG Police and founder Honorary Secretary of the J&K Regional Branch. The award ceremony was attended by Er J.B.S. Johar, Hony Secretary, J&K Regional Branch of IIPA. A Ph.D. in Botany from Kurukshetra University, Dr Ashok Bhan joined the Indian Police Service in 1976 and served the J&K State in various capacities including heading the State Vigilance Organization, Intelligence and Prisons Departments and the Police Academy. Dr Bhan, a strong believer in ethics based public service, has been steadily pursuing the objectives of the IIPA through the Jammu and Kashmir Regional Branch which he has brought to prominence as its Honorary Secretary for a decade till January 2010 and as Chairman till January 2015. He has rendered meritorious service in Jammu and Kashmir contributing immensely to intelligence gathering, anti-Terrorist operations, anti-Corruption measures and Police training on which subjects he has widely lectured and written. Dr Bhan as SSP Anantnag was grievously injured in an encounter in August 1990. A highly decorated officer for Gallantry as well as Disting-uished Service, he was awarded Chief Minister’s Gold Medal for Honesty, Integrity and Meritorious service (2007) for his extraordinary achievements whilespearheading anti-corruption drive in the State. Dr Bhan served a term as Member of the National Security Advisory Board. He is currently a Member of Shri Mata Vaishno Devi Shrine Board, Distinguished Fellow of IPCS, New Delhi and Patron of the J&K Regional Branch of IIPA.